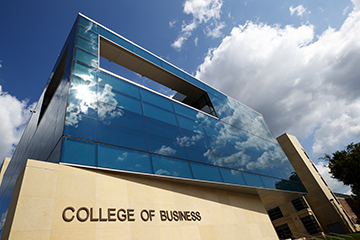 The College of Business Honors Academy is a four-year, cohort-based, enhanced business curriculum for high-ability students who have the potential and desire to become the next generation of business leaders. Academy students complete most of their foundation and core business courses together as a cohort using an action-based learning style focused on the development of critical thinking, technical and communication skills. These classes allow students to discuss and develop solutions for real-world business problems and create the social and intellectual bonds necessary to ready students for the ever-changing business world. Honors Academy scholarships can be added to any other scholarships awarded by Nebraska or the College of Business. Contact Erin Burnette with questions. *Honors Academy applications will be reviewed on a space-available basis after the November 2 deadline. 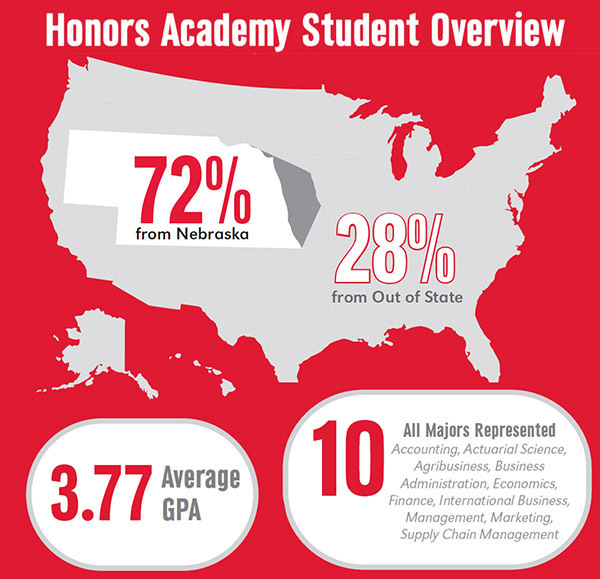 Students accepted into the Academy are automatically accepted into the UNL Honors Program. 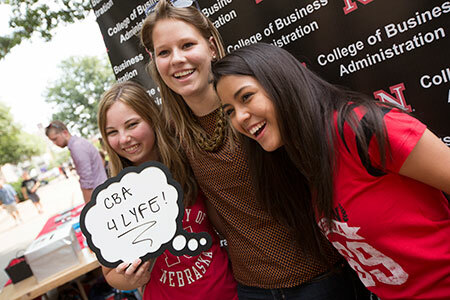 On a space-available basis, we accept transfer applications from Nebraska students going into their second-year of college and from students transferring before the start of their second year of college. The transfer application deadline is March 1. To begin the process, contact Erin Burnette. Academy students take 43 credits of honors level business coursework with their Academy cohort. This coursework consists of core and foundation courses common to all business majors. For your general education classes, major classes, and electives, you will be with other students from across the university. Majors in the College of Business generally require 120 total credits, so approximately 1/3 of the required credits are taken with your cohort. In addition to the Academy cohort classes, you will also take two honors seminar classes to fulfill the requirements of the UNL Honors Program. These seminar classes are taken with other honors students from across the university. The Bureau of Business Research Lab accompanying the Micro and Macroeconomics courses lets you take the theory you are learning in the classroom and use that theory to analyze current economic problems. The Principles of Finance class incorporates extensive Excel modeling applications so you learn how use financial theory to allocate scarce financial resources. This class also includes a Writing Lab component to help you master technical writing skills by creating financial analysis and recommendation reports. The Business Strategy Capstone class includes a practicum lab where you will work in a project team to solve business problems for corporate clients. Academy students are required to attend monthly leadership skills workshops. These workshops are led by prominent faculty and staff and successful members of the business community to help students build upon their leadership skillset. Each workshop focuses on a specific skill and includes interactive activities to help you apply the skill in your daily life as a college student. 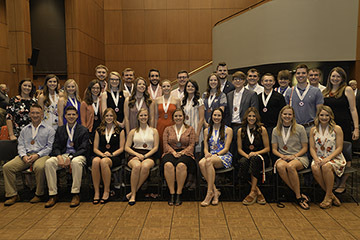 The Honors Academy Council is a group of current Academy students who helps plan events for current students and provides feedback on the program to faculty and staff. The Council will also be the sounding board for new ideas and will help shape the future of the Academy. Corporate site visits and more! How do I set up a campus visit to learn more about the Honors Academy? All campus visits can be set up through our Visitor's Center. 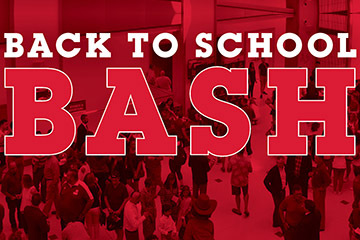 Visit Nebraska Admissions website to schedule your day. When you make your reservation, mention that you would like to meet with the Honors Academy in the "special accommodations" section and Visitors Center staff will be sure to put us on your schedule for the day. Can I be in both the Honors Academy and the Raikes School for Computer Science and Management? No, students cannot be a part of the Academy and the Raikes School. Both are cohort-based programs that take a specific sequence of courses. You may, however, apply to both programs and then decide which program is the best fit for you prior to enrollment. Are Academy students also in the University Honors Program? Yes! All Academy students are also part of the University Honors Program (UHP) and have all the rights and responsibilities of UHP students. Do I have to live in a specific residence hall with other Academy students during my first-year? No. Academy students can live anywhere on-campus, including, but not limited to Neihardt (Honors hall), our new suite-style residence halls, and fraternity houses. 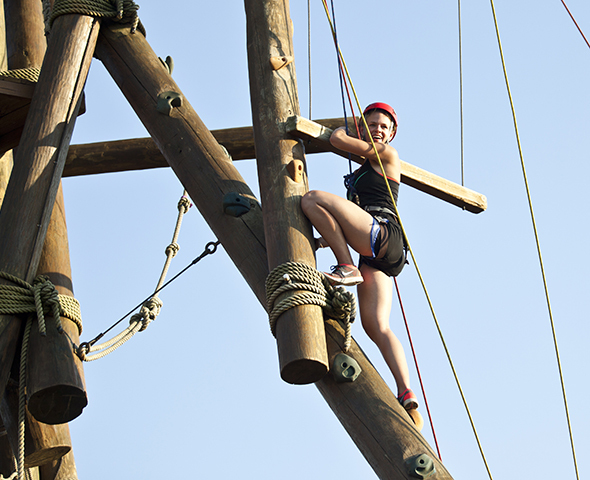 Students in the Academy may also choose to move off-campus after their first-year. Can student-athletes be in the Honors Academy? Yes! We are able to work with student-athletes to create a course schedule that satisfies Academy requirements and accommodates their practice and game schedules. Contact Erin Burnette with specific questions about balancing the Academy with your responsibilities as a Husker student-athlete. Can I double major or minor outside of the College of Business and still be in the Academy? Yes! Many Academy students have additional interests outside of business and select minors or double majors outside of the College of Business. Can I join a fraternity or sorority and also be in the Academy? I'm a transfer student. Can I apply to the Honors Academy? Yes! We accept transfer applications from students going into their second-year of college on a space-available basis. The transfer application deadline is March 1. To begin the process, contact Erin Burnette at eburnette1@unl.edu. I'm a current Nebraska student. Can I apply to join the Academy as a sophomore? Yes! We accept second-year applications on a space-available basis. The application deadline is March 1. To find out if there is space available and to begin the application process, contact Erin Burnette at eburnette1@unl.edu. Will I be taking all my classes with Academy students? No. Your core and foundation business coursework (43 credits) will be taken with your Academy cohort. For your general education classes, major classes, and electives, you will be with other students from across the university. Do I have to be in a specific major? All students in the Academy must declare at least one of the 10 majors within the College of Business. The 10 majors are actuarial science, accounting, agribusiness, business administration, economics, finance, international business, marketing, management, and supply chain management. Note: The actuarial science major and the economics major can be completed through either the College of Business or the College of Arts and Sciences. Actuarial science and economics majors in the College of Arts and Sciences are NOT eligible to be in the Honors Academy. I have college credit, AP credit, or IB credit for some of my classes. Will those count? Students who are bringing in credit (AP, Dual Enrollment, or IB) for both Macro Economics and Micro Economics will be expected to opt into one cohort based econ course their first semester. Do I have to maintain a certain GPA to stay in the Academy? Yes! To stay in good standing with the Academy you must maintain a GPA above the below levels at the conclusion of each academic year. To graduate from the Academy you must have a 3.5 GPA or higher. Where can I go for my study abroad experience and when should I plan to do a study abroad? 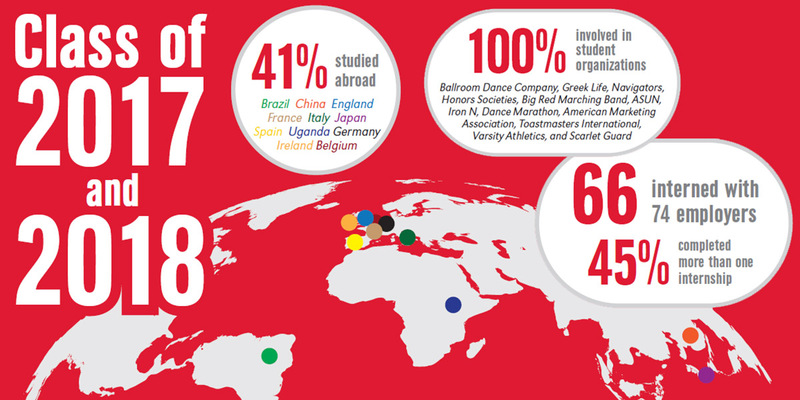 You can choose any University of Nebraska-Lincoln-approved study abroad opportunity in more than 50 countries and 140 universities worldwide. 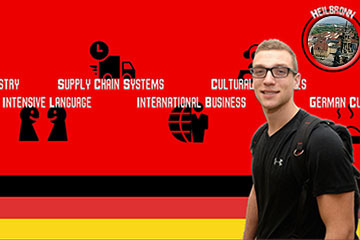 If you would like to earn business credits during your study-abroad experience, the College of Business offers five group study abroad programs including Oxford University in England, China, Japan, Italy and France. The study abroad scholarship can be used any time after the sophomore year for summer or semester-long study abroad. Many students choose to study abroad after their sophomore year, and then complete an internship experience after their junior year. Your Academy advisor will work with you to help you plan your study abroad. Toastmasters is an international public speaking organization with the goal of empowering individuals to become more effective communicators and leaders. It provides a non-threatening and supportive environment to give a variety of speeches and to both give and receive constructive feedback. Academy students will be Toastmaster certified by the end of their four years at Nebraska. Yes! There is a 3.5 GPA requirement to stay in good standing in the Honors Academy. For more information about Academy requirements, please visit our Current Students webpage. What does it mean to be Microsoft Master Certified? Microsoft Master Certification requires that students successfully pass mastery skills tests in Microsoft Word, Excel, PowerPoint, and Access. All College of Business students must fulfill this requirement prior to graduation.